Greater internet and mobile device accessibility are driving e-commerce growth in Southeast Asia. According to ABI Research, Smart Retail has gone through revolutionary changes in the past 10 years and will exponentially continue to do so going forward. Brick and mortar stores are no longer the only option for consumers across the globe to make their everyday purchases, due to significant advancements in technology, both in-store and online. Key players include Senion, who implements some of the world’s largest Indoor Positioning System (IPS) solutions to enhance in-store experiences, and AisleLabs who provides shopper traffic behavior analytics to help retailers optimise store layouts. Leading POS software vendors, Shopkeep and Square are allowing retailers to sell across multi-channels from a single platform. These and other key vendors are paving paths to making the offline and online worlds seamless experiences. Enterprise wearable shipment will reach over 118 million in 2022, increasing from just over 38 million in 2017, a CAGR of 25 percent, according to ABI Research. The enterprise wearables market is continuing to see stronger growth than the consumer market, which has shipment numbers increasing at a lower CAGR of 13 percent. Healthcare devices, wearable cameras, and wearable scanners will account for 73 percent of enterprise wearable shipments in 2022. Innovative companies are leading the charge, such as Royole with flexible components, Waverly with real-time translation, and Axon (previously Taser) with wearable cameras. The market for analytics within Pay TV services will grow by 105 percent in the next five years, from US$1.8 billion this year to US$3.7 billion in 2022, according to ABI Research. Comcast, Netflix, Sky, Telstra, and other successful video companies differentiate themselves from their peers by their strong use of analytics to optimise and improve operational metrics. Pay TV companies are starting to transform products to support an analytical focus, moving in the direction of artificial intelligence and machine learning to enable self-optimisation. Video companies sell today’s products in a host of point-solutions, including content and metadata engagement, customer management, network optimisation, and consumption measurement. Larger network-oriented business support systems and business intelligence vendors also play a significant role within these markets. What was popularised by Google Earth is now easily available and affordable for consumers. That is the 360-degree camera, of course. Demand for such cameras is expected to surge among prosumers and professionals. ABI Research expects professional grade cameras and mid-tier, prosumer 360-degree cameras to hit nearly two million shipments by 2021, with consumer 360-degree cameras to top four million by the same year. “The most prominent force driving 360-degree video content and hardware is virtual reality (VR). And though VR has been experiencing a period of content starvation due to its novelty, small early install base, and the high cost of premium VR, support from major content platforms will lessen this for 360-degree video,” said Eric Abbruzzese, Senior Analyst of ABI Research. Pokemon Go is taking the world by storm with its use of augmented reality (AR). The craze has received widespread publicity across the world as hordes of people go around in search of Pokemon using their mobile devices. AR is also set to leave footprint in the enterprise market. ABI Research forecasts that AR in enterprise will explode over the next five years, as the technology will add functionality to existing workforces that was not previously possible, with remote assistance to be the primary use case. Combined with increased safety and efficiency, this will drive investors and project managers to explore AR with smart glasses applications in the healthcare, industry, and government market segments forecast to hit 27 million shipments by 2021. At just US$50, the Amazon Fire tablet is expected to stoke the flames in a highly-competitive tablet market, according to ABI Research. The Fire’s price is significantly lower than the average vendor selling price of US$323. It is a calculated risk that Amazon can afford to take as the company shifts its revenue focus away from solely hardware and toward recurring digital content sales. Sporting a seven-inch screen, the tablet comes with 8MB of built-in memory, quad-core 1.3GHz processor, dual camera, and battery life good for up to seven hours of reading, web surfing, video watching, and music listening. The personal computer (PC) is still alive and breathing. According to ABI Research, 163 million notebook PCs shipped globally in 2015. The majority were laptops, which constituted nearly 80 percent of the category. The data suggests that despite a floating myth speculating that it will only be a matter of time before PCs meet their demise, the market is still going strong and shows no sign of slowing down in the immediate future. “Industry experts greatly exaggerated the death of the PC. The platform is continuing to evolve its designs to provide flexibility for productivity purposes, while also adapting its shape to support tablet-like, touch applications. Chromebooks and ultraportable PCs will continue to drive the most growth within the notebook PC market,” said Jeff Orr, Research Director of ABI Research. NVIDIA has released the 1.0 version of two powerful VR software development kits (SDKs) — NVIDIA GameWorks VR and NVIDIA DesignWorks VR — to help developers deliver VR games and applications. Immersive VR requires seven times the graphics processing power compared to traditional 3D apps and games. When used in conjunction with the company’s industry-leading GeForce and Quadro GPUs, these SDKs provide developers the tools to create VR experiences, increase performance, reduce latency, improve hardware compatibility, and accelerate 360-degree video broadcasts. Every other piece of mobile accessory in the world is sold in the Asia-Pacific (APAC) region. To be precise, APAC accounts for 52.9 percent of all mobile accessories shipment, according to ABI Research. Admittedly, the region does have a huge population but the sales figures are still staggering as global revenues for mobile accessories are expected to hit US$81.5 billion this year. Driving the demand are cost competitive smartphones. China holds huge opportunities for accessories due to its large existing and potential consumer base, rapid growth of smartphone and tablet adoption, a growing online retail market and increasing disposable incomes. More Chinese smartphone vendors are investing in equipping their devices with fingerprint sensors with such phones expected to hit one billion shipment by 2020, marking a 17 percent CAGR, according to ABI Research. Biometrics on smartphone devices have moved past the simple authentication option and are headed towards establishing a more robust mobile payment solution. However, other biometric modalities such as face, voice and eye-based recognition are currently moving out of the fledgling phase and are to be integrated as highly-secure – albeit more expensive – biometric capabilities in smartphone devices with a five-year CAGR revenue growth of 144 percent. Rising demand for mobile games is driving the video game market to reach US$80 billion in 2020, up from under US$70 billion last year, according to ABI Research. Traditional PC and console segments, on the other hand, will see a one- to two-percent annual growth. Triple-A titles have the potential to dramatically change a developer/publisher’s financials, but gaming’s long tail is equally important to the continued growth of the industry. This is particularly true in the mobile space where a hit title can catapult a mobile game developer into the upper echelons of the market — as was true for developers such as King Digital (Candy Crush Saga) and Supercell (Clash of Clans). Driven by increasing complexity in security requirements, the global managed security services market is expected to be worth US$15.4 billion by the end of 2015 and hit US$32.9 in 2020, according to ABI Research. Implementing and managing a successful security programme is a complex affair and most organisations lack the security expertise to manage security solutions from a wide variety of vendors. Rising threats, government regulations and a lack of internal resources are driving businesses to turn to managed security service providers which offer expertise and dedicated security personnel. Information security incidents are on the rise as cybercriminals increase their focus on both large and small businesses. In 2014, there was a 49-percent increase in data breaches and a 78-percent increase in the number of data records stolen or lost compared with 2013. This indicates that a comprehensive IT security system is becoming increasingly necessary across the corporate, consumer, and public sectors. Many may have been misled that Google Glass is dead and gone, a failed innovation. But that’s not what is happening. Google has simply retired it Glass Explorer Program and graduated Glass out of Google[x]. Smart glass is alive and well and ABI Research expects 2015 to be a big year for smart glasses with unit shipment growth of nearly 150 percent, almost of all of which will be in the enterprise and public sector. More than 90 percent of smart glasses are expected to be sold in the enterprise or public sector for uses such as remote assistance, police and military, security, warehouse and barcode scanning, and, in the consumer space for gaming. Global SIM card shipment will reach 5.2 billion units in 2014, a 5.32 percent increase from 2013, according to ABI Research. LTE, NFC, and M2M are gaining momentum and considered the trends for the next few years. Large markets such as India, China, and Saudi Arabia are currently among the last countries to undergo ID registration regulations. Among them only India saw a massive decline in shipments during 2013 but data from 2014 show that the market has successfully stabilised and steady growth is expected from 2015 onwards. Intel, NVIDIA and Qualcomm are leaders in their respective markets but all of them have set their eyes on and foot into the automotive market. Building on their leading edge technologies, these consumer chipmakers have developed solutions that are competing against established automotive chipset suppliers such as Freescale, Renesas, TI, and STMicroelectronics. The reason is clear as the automotive head-unit processor market is expected to grow from US$680 million in 2013 to US$1.95 billion in 2020, according to ABI Research. “Automotive head-units are transitioning from proprietary architectures requiring long development cycles and Tier1-led integration efforts towards platform designs. Ford set the tone back in 2007 with its SYNC solution based on CPU hardware from Freescale and the Windows Embedded OS allowing quicker development time frames and independence from the previously dominant Tier 1 suppliers,”said Dominique Bonte, Vice President and Practice Director of ABI Research. Samsung has retained its pole position in ABI Research’s tablet vendor Competitive Assessment. In the analysis of 23 leading tablet vendors, ABI Research ranked companies on several criteria for product implementation and vendor innovation. The Korean giant prevailed in the innovation category and finished second in the implementation strategy. Close behind Samsung in second place is Apple. Clearly dominating in shipment volume, Apple has been a strong contender in the tablet ecosystem. Apple places number one in implementation strategy but comes in close second for innovation. 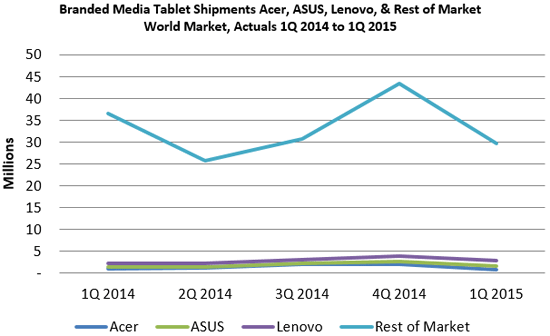 The two leading tablet makers have managed to stay ahead of other tablet OEM vendors. In third place is Lenovo, which has done a great job of expanding its tablet portfolio by marketing to a large audience range and providing unique user interfaces.